WHEN I STARTED RUNNING I had a close friend and training partner named John. He was a year behind me in school but was born to run. While I ran twice a day to improve and compete, he flew on several runs a week. And even when he was just beginning, he could stride effortlessly. 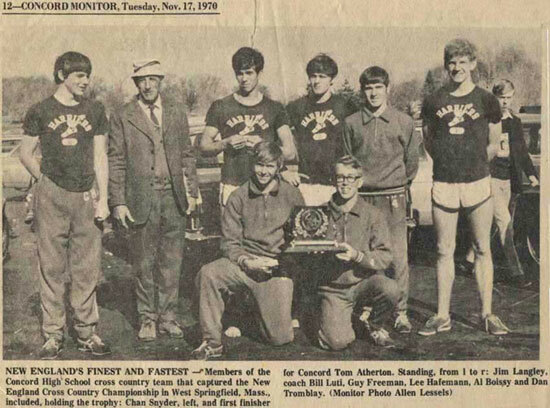 We ran the roads around our homes in Concord, New Hampshire and worked our way into the top ten on the Concord High School cross-country team (photo, below). The best thing about a running partner is having someone to talk to, and over the years we discussed many things, like the day we spent ten miles trying to figure out ways to carry reservoirs of water on our bodies. (No, we didnt invent the CamelBak hydration system.) And there were all those miles spent gabbing about girlfriends. Naturally, we would challenge each other regularly, sprinting, setting times to try to beat, trying to run more days in a row. So it wasnt too unusual one snowy January day for John to bet me a dollar that I couldnt run the Fisk Road loop (a six-miler) clad only in shorts, T-shirt, shoes and socks. There was a foot of snow on the ground already and a major blizzard going on. Id bragged that I could run in any weather in shorts so John was just trying to make me eat my words. Instead, I hit the road with John screaming, Youll never make it! out his door. My theory was simple. I figured that if I ran fast enough, Id keep my body plenty hot. I charged down Pine Street at 5-minute-mile pace and quickly warmed up enough that the snow striking my chest and face immediately melted. It was exhilarating running in the deep snow. My feet landing ever so softly flattening the snow with a crunching sound. Otherwise it was dead quiet save for the sound of my breathing. Best, there were no cars and I could pace right down the center of the road. I was determined to show John up and win the buck. But I wasnt worried at all about survival. Shoot, if things got really bad, I could always knock on someones door and ask to come in and warm up a bit. It might be a little embarrassing but I could handle it. I visualized a horribly humid day in July and kept jamming. In no time I was past halfway and climbing Fisk hill, the tough part of the loop. I leaned into the hill, shortened my stride, pumped my arms faster and worked the climb. Cresting the hill, I noticed that my longish hair was frozen and that my fingers were numb. The stretch home was a gradual downhill for about two miles. I envisioned Johns face when I knocked on his door and demanded, Pay up. I thought he might accuse me of cheating but realized hed have kept track of the elapsed time and would know Id gone the distance. My fingers were stiff with cold now. My feet were starting to lose feeling and my ears ached. But I had less than a couple miles to cover; too close to quit. Suddenly from behind came a beep. Then another. I looked back and saw a guy in a car so I moved over to let him pass. But he didnt want to go by. He pulled up next to me and I realized it was a friend of the family who had recognized me. Now he was insisting that I get in his car. I resisted but he made it clear he wasnt fooling around. So I got in the toasty warm car and he drove me home lecturing me about how stupid I was all the way. John was delighted Id failed. Here I am when we won the New England High School Boy's Cross Country Championships.